Today we are going for something different here at WP Mayor, we’re taking a look at the most well-known WordPress agencies and companies. These are companies who have constantly been producing top notch WordPress websites for a number of years, and their people are well known in the WordPress community. They can serve as an inspiration for you if you would like to build a new company based on providing WordPress services, or you might also end up trying to join one of these companies if you prefer having a job with established people. The basis of this selection is purely my observation of the WordPress industry during the last couple of years. There are of course many more great WordPress freelancers, companies and agencies, however these are the best ones which I have come across. They have been producing excellent work that has served as an incentive to improve my own skills, and I hope you will also find them inspiring. Saucal is based in Toronto, Canada. They’re WooCommerce specialists and are also WP Engine partners. Saucal is all about building your business online; harnessing the power of the Internet to realize your true business potential in ways you’ve never thought possible. They design revenue-maximizing WordPress sites that actually drive the growth of your web-based sales; improve user experience; and, tackle highly personalized and complex tasks related to your business. Saucal develop customized apps and plugins that succeed in capturing leads and increasing sales power. While others may build you a beautiful looking website, Saucal builds websites that attract new business in the virtual world. Of course they look beautiful, too. I know the guys from Saucal personally and highly recommend them. What I love about them is that they really focus on your business results, and they make sure that your new website is a real investment that generates great retuns rather than just being one other business expense. 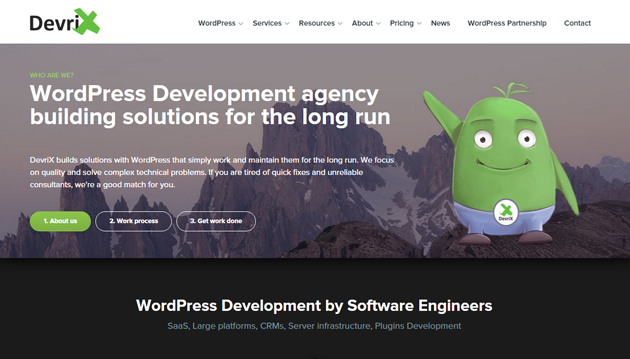 DevriX is a European-based technical WordPress development agency providing custom solutions and ongoing development for successful businesses. DevriX specializes in SaaS development, large WordPress multisites and technical architecture in order to provide scalability, extensibility and steady growth for established organizations. 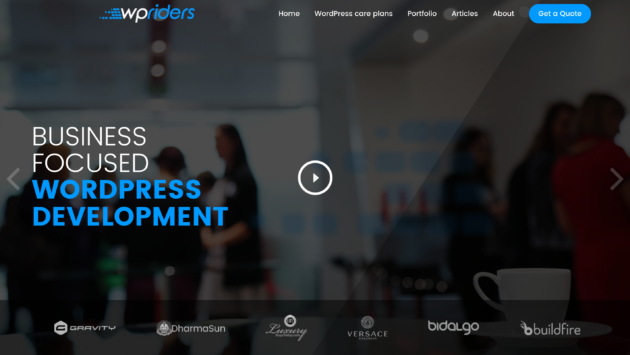 WPRiders is a technical WordPress Agency for clients across 5 continents. They are a thinking partner who helps you take your business to the next level with the right WordPress powered tools. They have an agile based approach that involves a mix of business consultancy and software development, tailored towards obtaining maximum value for the given investment. WPRiders is not a mass market agency. Rather, they handle a few challenging custom development WordPress projects for ongoing customers who want a reliable, honest and a highly professional team. You can rely on them for custom WooCommerce development or custom integrations with third-party APIs like HubSpot, Ontraport, Twilio or you name it. They also do custom theme and/or plugin development work that requires a more thorough approach and understanding of your business requirements. 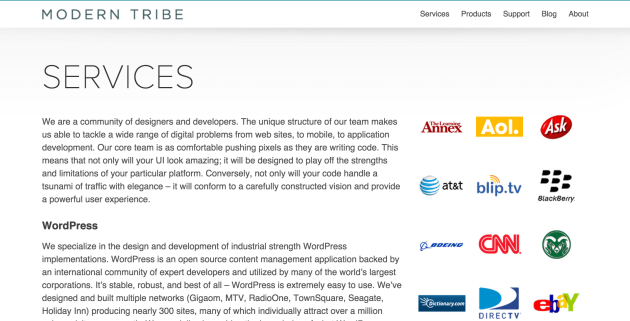 Modern Tribe specialize in the design and development of industrial strength WordPress implementations. They push the boundaries of what WordPress can do. Full galleries, social media and extensive API integrations, event management, front end authentication and single sign-on, custom layouts and designs that transcend the traditional blog, community sites with forum integration, live streaming media – you name it, they can code it. WordPress is the perfect foundation for the web and having the right blueprint is imperative to success. WebDevStudios leads the way by using WordPress to architect and build cutting edge web and mobile experiences. Iron to Iron is a company of two because they believe the best results come from a direct partnership with clients. In other words, they do the work and they maintain the relationship. No sales reps, no account execs, no big guns trying to represent the work of someone else. Simply two co-owners – one designer, one developer – motivated to listen and serve, from start to finish. interconnect/it design and build WordPress websites. Their main goal is to develop WordPress theme and plugin solutions that are robust and easy to use, improving your workflow and reducing stress levels. They do this for clients like The Spectator, Informa T&M and Telegraph Media Group, to name a few. WordPress development is at the core of the business at Wholegrain. The majority of the work that they do involves developing custom themes and plugins for clients, configuring premium themes, or fixing and enhancing existing WordPress websites. W3 EDGE offers value by managing the construction of your site from start to finish. Cost-effectiveness begins at the design stage. They also employ open standards during the development and implementation of your site, making it easier and less costly to make changes to your cyber-storefront appearance and/or list of features. Crowd Favorite delivers custom WordPress development for large enterprises that are embracing open source. They not only develop custom themes and plugins for their clients, but also connect it to a variety of existing corporate systems. Human Made specializes in high-end WordPress development & consultancy for Enterprise & Big Media. Typically involving a high degree of custom development with a focus on performance & security at scale. Each project provides a different challenge. A WordPress.com VIP partner since 2012, they have a proven track record in dealing with big clients. SPYR is a creative agency focused on brand development, software design, publishing, and deadlifts. Since 2011 they have been building SPYR brands and have collaborated with hundreds of top-shelf companies and entrepreneurs to reinvigorate their brands and connection strategies. inSourceCode has a relatively short, albeit very interesting, history. They specialize in WordPress and have built servers from the ground up. They are experts in Linux, Apache, MySQL, PHP, WordPress, WordPress Themes, WordPress Plugins, general code, and server optimization. In addition to work-for-hire, they also build custom Web applications. Range are a design and development agency specializing in high quality design and WordPress development. Backed by first-class development, Range creates informed and strategic designs that are highly refined and technically sound. At 10up they make content management simple with their premiere web design & development consulting services, by contributing to open platforms like WordPress, and by providing tools and products that make web publishing a cinch. Have we missed on any other top companies and WordPress agencies? Let us know in the comments below. On what criteria, or evidence, has this list been derived? Hi Tony, as I described in the post it’s my own personal selection based on my involvement and observation of all things WordPress during the last couple of years. The portfolio and contributions of these companies should be enough evidence that they are up there at the top and worth following. Great list. The only one I have had interaction with is 8bit and they are a great group of guys. Thanks for sharing this info! Some names I know here and a few I don’t. Great list of teams to check out for inspiration. Thanks! Thanks so much for putting 8BIT on there! Just to be clear, it’s all CAPS: 8BIT. Thanks for listing 10up. In a nit rather opposite to 8BIT’s, we are one word and all lower case: 10up, not 10 UP. Thanks again! There are a lot of really awesome companies in this list. I studied quite a few of them when I was setting up a roadmap for where we’d like to be within the next two years. Great list. There are so many web development agencies out there, it’s hard to get a good read on who will be the best fit for your needs. Our company, AlphaPoint, has been working with a great team at HSM for a number of years. We highly recommend these guys, very creative and responsive group! Hi Jean, I believe Exygy belongs in that list. We do a lot of advanced WordPress work for our awesome clients, and are very involved in the WP community. We co-host the San Francisco WordPress meetup with Automattic, we build plugins, we blog about WordPress, and we contribute to the WP core. Hey Jean, thanks for this list. Do you have an update for 2015? :-) No pressure, no rush, just curious. Cheers! Pretty impressive list of companies but I want suggest WPGeeks Ltd. a WordPress Development company which is delivering great results for their clients. How lovely to find ourselves (Wholegrain Digital) on your list of selected companies! Thankyou! Thanks for featuring DevriX! We are truly honored, and are genuinely thrilled helping successful businesses running WordPress platforms. You’re most welcome Mario, keep up the good work! Thanks for the compilation Jean, I can certainly recognise most of them from their contribution in the WordPress community/industry. Like you said there are of course a lot more great WordPress professionals out there that don’t get mentioned or recognised because they simply don’t come out as much. Do you have any thoughts on how those can stand out in this crowd? Hi, you can talk about http://www.id-meneo.com too! One French agency cannot hurt. Thanks for share this informative post. i am also wordpress developer and provide wordpress development services can you please send me some knowledge about PSD because i am new that services . I would like to add Really Effective to the list. We are an agile WordPress agency focused on increasing our clients’ bottom line, not just doing pretty graphics. Contact us and let’s start improving your results right away! http://www.danitsolutions.com is also one of the best WordPress development companies that we have worked with and they are pretty good so far. We are satisfied with them, though we highly appreciate this post as it shows many other vendors that we can consult. Thanks Jean Galea. I had recently hired Wisitech for my Woocommerce website development. The best part is they have given me the fully optimized website which was indexed by Google within 4 days after making it live. Amazing team of developers with good knowledge of optimization as well. Hi folks, great list, and I would like to add WP-Heroes http://www.wpheroes.sk from Slovakia to the list, which is WordPress department of Digital Agency called ZoneMedia http://www.zonemedia.sk and one of the most famous WordPress developers in this little country cooperating with big brands and agencies from all over the world. Feel free to contact us anytime. Check out http://kota.agency who build WordPress websites in London with an arty approach. A Great list of WordPress development companies. A few months ago, I was looking for a WordPress development company to build my business website. I found a list of companies by searching on the web, but I was so confused. At that time, My friend recommended me one company “Thinsquare” that provides website development services. I contact with the company to build my site and Really, the company provides quality services. I am very happy with their services. Hi, Emma. I am also looking for a company to build my Ecommerce business website. Can you share the link of website? Just try http://www.segurotechnologies.com I got the reference from WPmayor and that was nice. Thanks WPmayor for the discussion. Great List! There are a lot of awesome companies in this list and provide the best WordPress development services. This is really a great list of best WordPress development companies. Pretty impressive list of companies, but Wpmayor you forget to add Leading WP company of India. If possible review http://www.wordpresswebsite.in aswell. Awesome! This is what i was in a hunt for. Thanks for the info. I checked many of pages from list – pretty impressive. I believe every wordpress agency would like to be on such lists. We look forward to the future to be helpful to everyone (by plugins or themes) but at this moment we focus on being a perfect partner for our clients, So these types of letters are for us. How about including a few Australian agencies on the list? Here is one agency that I think deserves a spot on this list- Websites ‘N’ More. Awesome list! Check out http://www.kotacreative.co.uk who make beautiful WordPress websites. Webdesign7.co.uk is a bespoke website development agency using WordPress as a prefered CMS. We also have developed a number of WordPress plugins and custom themes. So for really advanced website development Webdesign7 is the agency of choice. Located in South London. Hey Jean, thanks for this list. Do you have an update for 2018? :-) No pressure, no rush, just curious. Cheers! This is an inspiring list! Great to see some UK-based agencies on here too. How is it possible that our WordPress agency https://frontdevelopers.com/offshore-wordpress-development/ is not included in the list. I am sure you will need to redo the list. Perception System is a leading WordPress web development company based in California. Our expert services include theme, plugin development as well as WordPress maintenance.